This "mini-game" is a simple "Space Invaders" style side shooter, with very basic controls and game-play. Simple move and fire controls with enemies that don't fire at you; so that those who are slower players are not being blasted and discouraged. The "Borg" ships are used due to the basic shapes (circle, diamond, square) that make sense to move around without the ability to fire back. Your scored is affected by time, missed shots also dock your score. If you miss 3 shots in a row you are informed by a crew member in a slide in comment with a saying based on the character. There are 4 ships to choose from, plus a Golden NCC-1701 you can unlock if you earn the Gold Trophy. There is also a cheat code to use the U.S.S Vengeance from "Into Darkness". It takes approx 15 minutes to play through the 4 Stages and the 5th and Final Boss stage where you Battle the "Borg Cube". In the final battle you must fire into a relocating "hole" on the cube. The cube does travel slowly toward you and when it reaches the enterprise it will "smack" it and dock you some points and slide back to the start then start moving towards you again until destroyed. Captain Kirk presents you with your score at the end along with your hit ratio. When done playing this software also runs as a background desktop scrolling application allowing your chosen Enterprise to fly across your desktop. (Warp speed available). File size exceeds the limits of indiedb so be sure to visit vipergts96.com and download now! Depending on the download count of the game, the option to post your High Score online could easily be added. Allowing everyone to compete with others around the world for the best score. The 3-Letter Name System would definitely be used. *Picture is an example; scores, names, and dates are irrelevant. 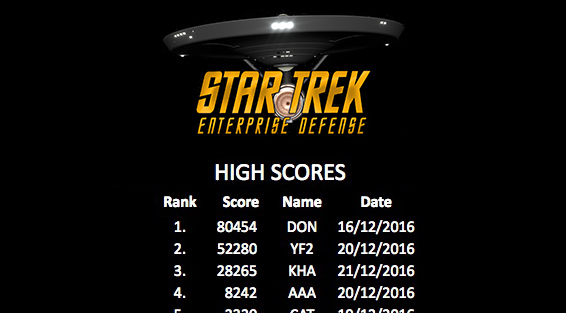 Tool which downloads the 4 Archive files from vipergts96.com to install "Star Trek Enterprise Defense"